Go here for more about Ben Chifley. Go here for more about Ben Chifley's The Light on the Hill speech. 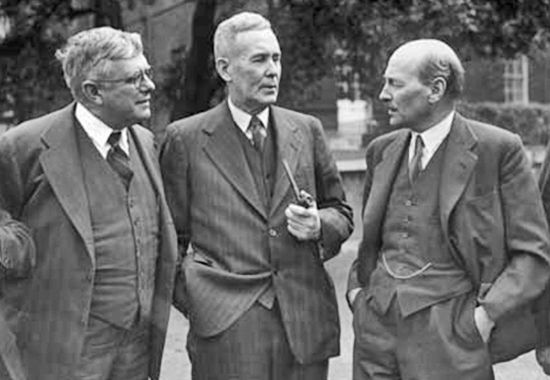 Leaders of the Australian Labor Party Herbert Evatt (left) and Ben Chifley (middle) meet with British Prime Minister Clement Attlee (right) at the Dominion and British Leaders Conference in London, 1946. — National Archives of Australia. It follows an excerpt from the transcript of Ben Chifley's The Light on the Hill speech, delivered at Sydney, Australia — June 12, 1949.
of leading the Labor Party for nearly four years. They have not been easy times and it has not been an easy job. It is a man-killing job and would be impossible if it were not for the help of my colleagues and members of the movement. No Labor Minister or leader ever has an easy job. The urgency that rests behind the Labor movement, pushing it on to do things, to create new conditions, to reorganize the economy of the country, always means that the people who work within the Labor movement, people who lead, can never have an easy job. The job of the evangelist is never easy. Because of the turn of fortune's wheel your Premier (Mr. McGirr) and I have gained some prominence in the Labor movement. But the strength of the movement cannot come from us. We may make plans and pass legislation to help and direct the economy of the country. But the job of getting the things the people of the country want comes from the roots of the Labor movement — the people who support it. When I sat at a Labor meeting in the country with only ten or fifteen men there, I found a man sitting beside me who had been working in the Labor movement for fifty-four years. I have no doubt that many of you have been doing the same, not hoping for any advantage from the movement, not hoping for any personal gain, but because you believe in a movement that has been built up to bring better conditions to the people. Therefore, the success of the Labor Party at the next elections depends entirely, as it always has done, on the people who work. I try to think of the Labor movement, not as putting an extra sixpence into somebody's pocket, or making somebody Prime Minister or Premier, but as a movement bringing something better to the people, better standards of living, greater happiness to the mass of the people. We have a great objective — the light on the hill — which we aim to reach by working the betterment of mankind not only here but anywhere we may give a helping hand. If it were not for that, the Labor movement would not be worth fighting for. If the movement can make someone more comfortable, give to some father or mother a greater feeling of security for their children, a feeling that if a depression comes there will be work, that the government is striving its hardest to do its best, then the Labor movement will be completely justified. It does not matter about persons like me who have our limitations. I only hope that the generosity, kindliness and friendliness shown to me by thousands of my colleagues in the Labor movement will continue to be given to the movement and add zest to its work.